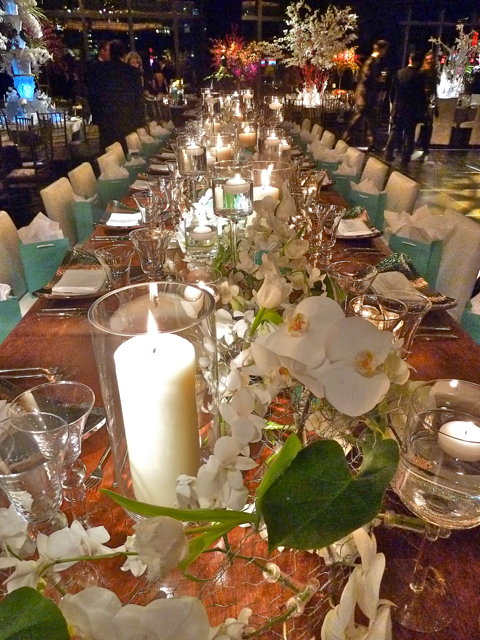 This year’s event honored Tiffany & Co. for their foundation’s decade of support as the Founding Sponsor of The Orchid Show. There was also reason for celebration as the iconic company is about to celebrate its 175th anniversary. 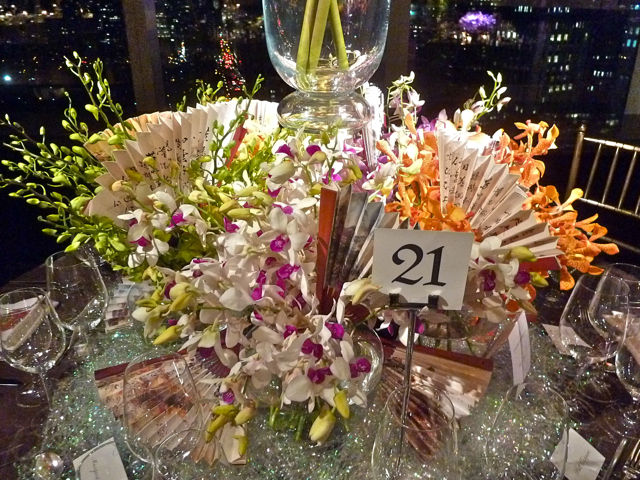 In addition to Tiffany, BNY Mellon andVeranda Magazine were again sponsors for the evening. 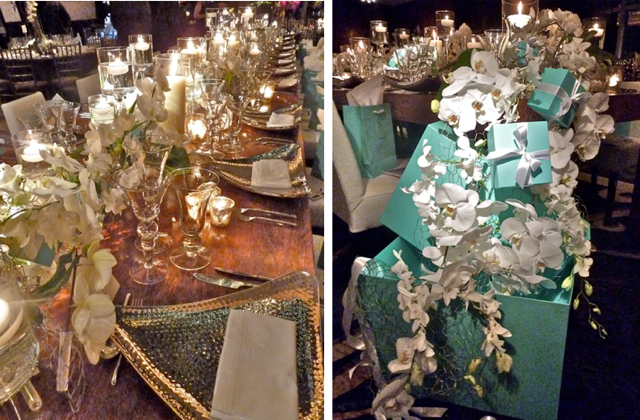 Anchoring the room was the gorgeous Tiffany and Co. table designed by Richard Lambertson withDavid M. Handy Events. Elegant yet fresh and modern, it handled its size with grace and glamour. 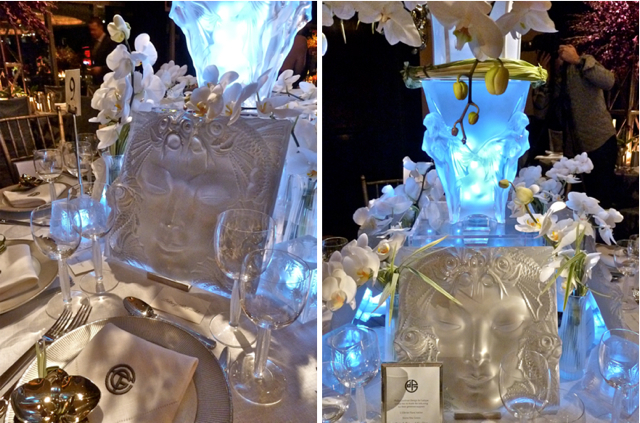 As soon as I saw this striking table, I knew it was the work of Alessandra Branca. Using her signature black, white and red color palette, she created a dramatic look. It was my pleasure to have a chance to chat with the talented designer whose effervescent personality is often expressed in her interiors. 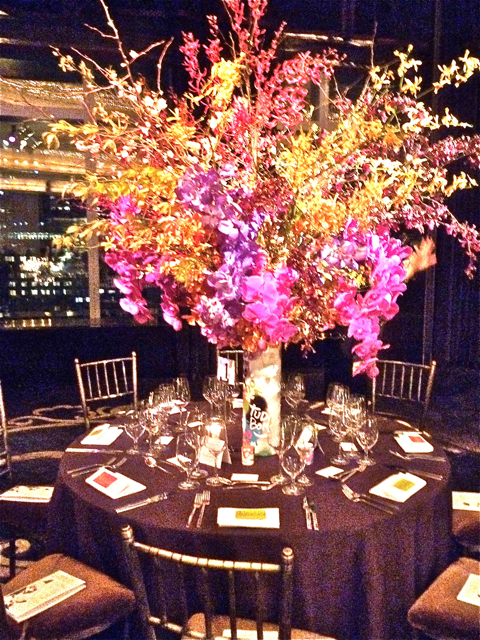 I loved how Angelica Gomes of Angelica Flowers and Events set off her fabulous colorful bouquet against the dark tablecloth. And you can’t really see the vase but it was a fun handpainted almost graffiti-esque container that was a great counterpoint to the elegant flowers. 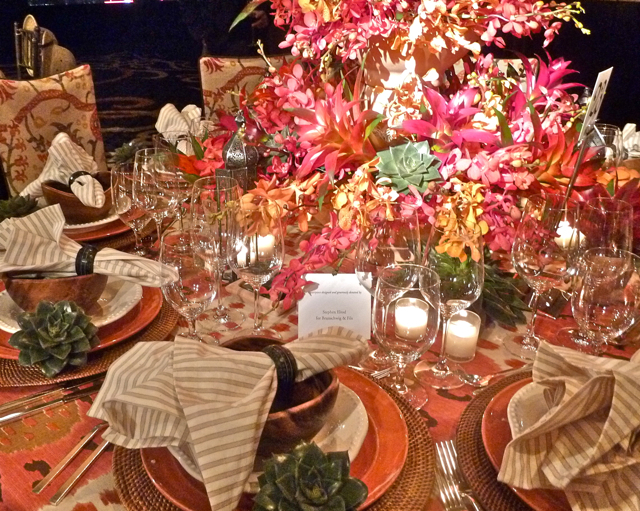 Be sure to visit her website – it is as colorful and beautifully designed as her table. Just like his work, architect/designer Rafael de Cardenas‘ table with Baccarat, reflected his cosmopolitan respect for tradition with an eye toward the contemporary. 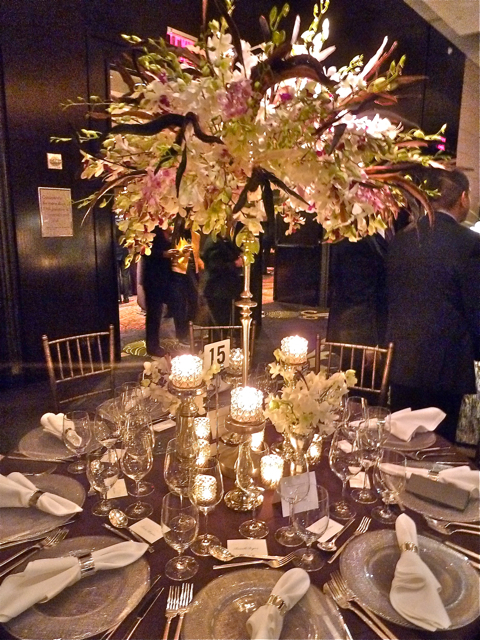 The crystal was a sparking addition to the elegant bouquet. 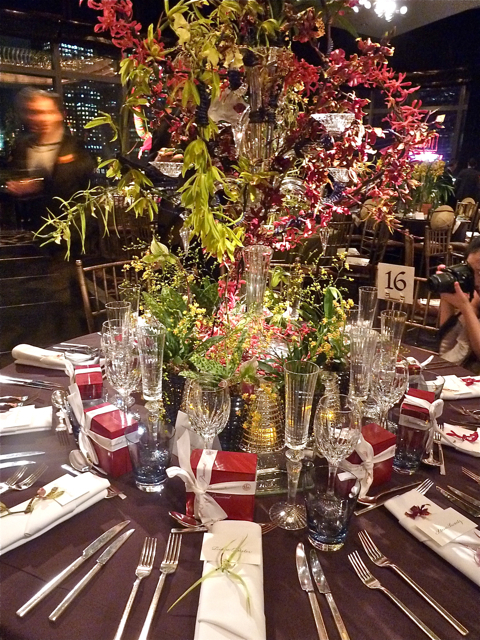 Bowman Dahl Floral & Event Design had a very clever solution to the centerpiece. 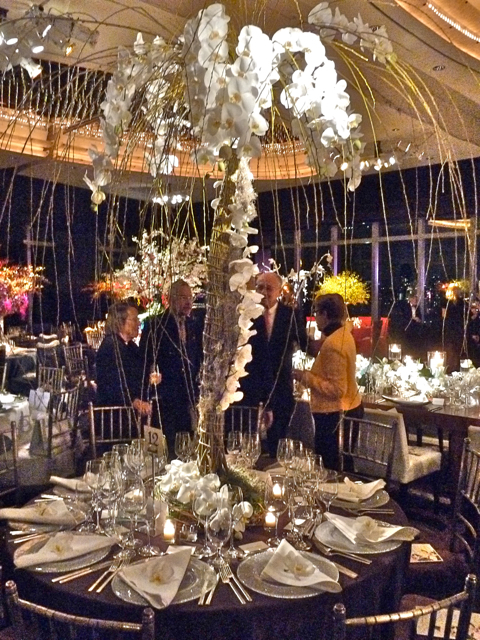 Set in a very thin candlestick like structure, the bouquet explodes at the top in a canopy of color, leaving room below for across-the-table conversation. 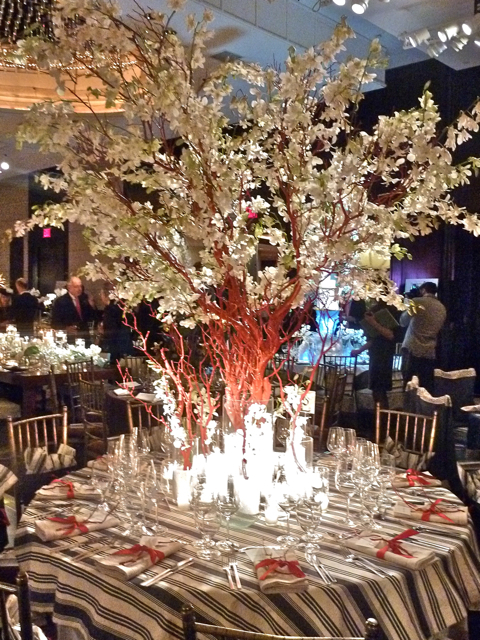 My photo does not do justice to designer Campion Platt‘s jubilant ode to Chinese New Year. 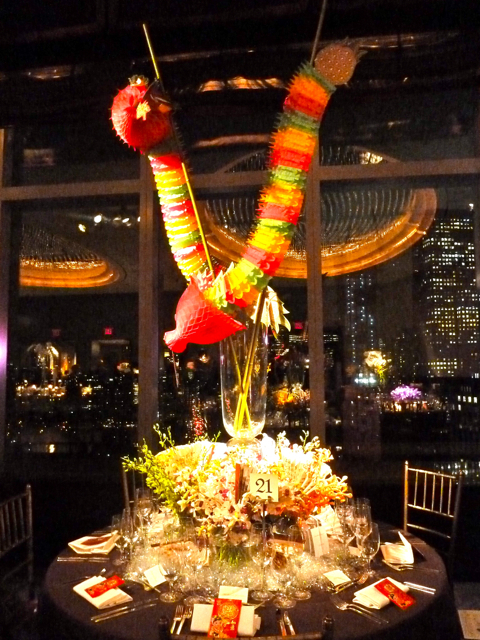 The fantastic paper dragon towered ceremoniously above an elegant table display. 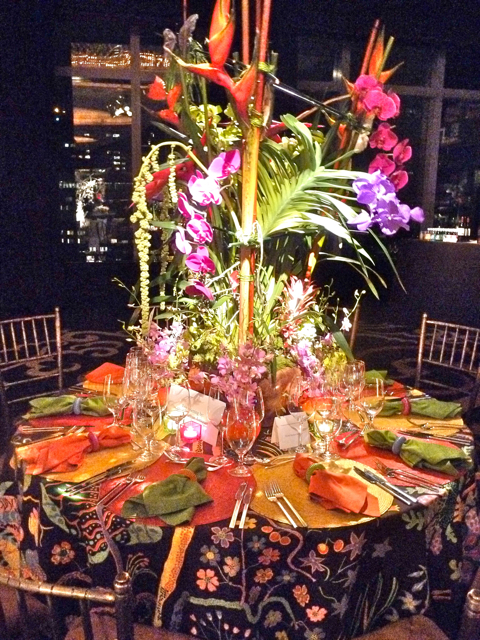 The table of antiques dealer David Duncan was a carnivale worthy display of color. 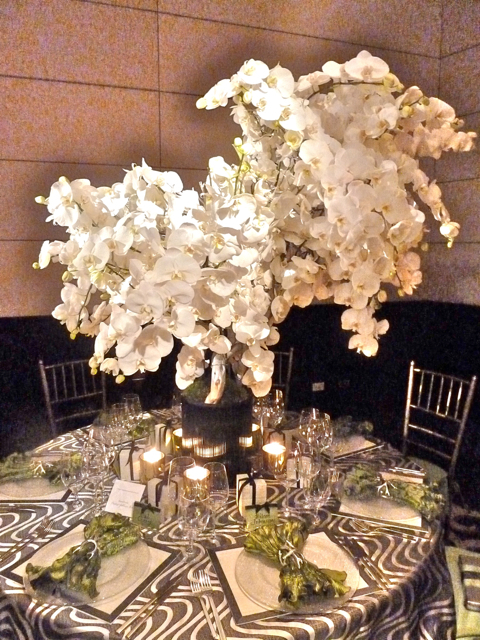 What a great mix of size and form in the centerpiece. 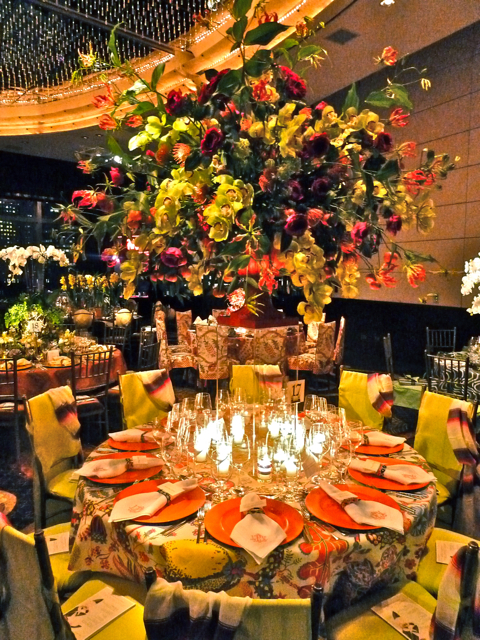 Felipe Sastre created a majestic statement for FlowerSchool New York. 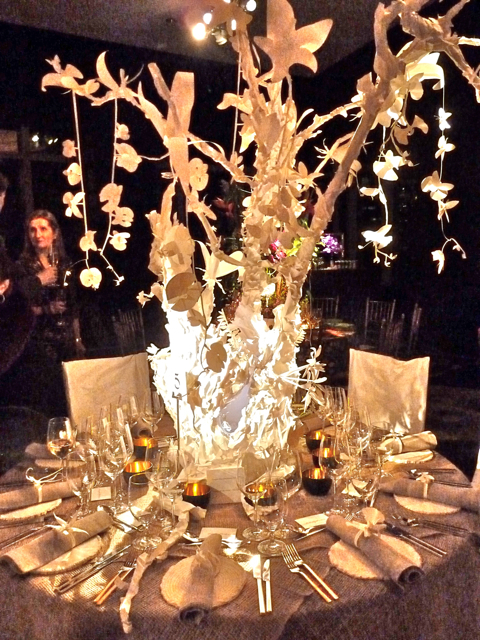 With such a fabulous tree-like structure, I think it was the right decision to keep the table neutral. It was all about texture and proportion. 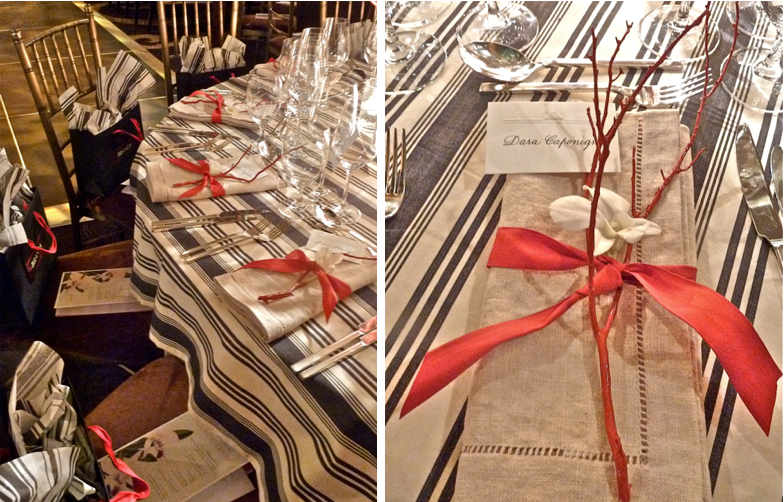 Boutique owner Laura Vinroot Poole‘s table, executed with John Lupton, Andrew Thomas andLeontine Linens, was an explosion of color. 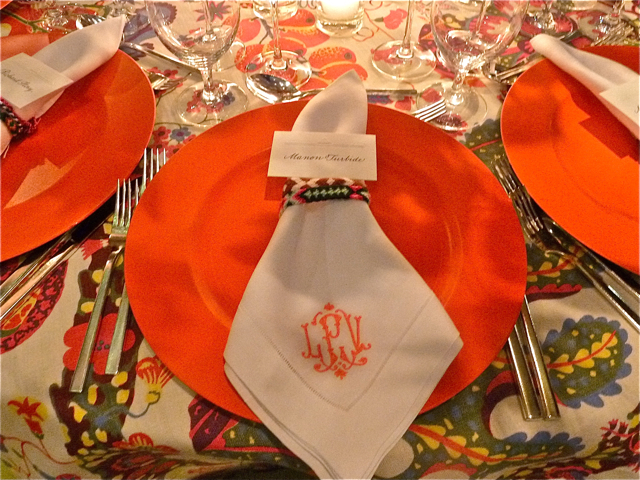 And I of course loved the orange monogramming on the napkins! 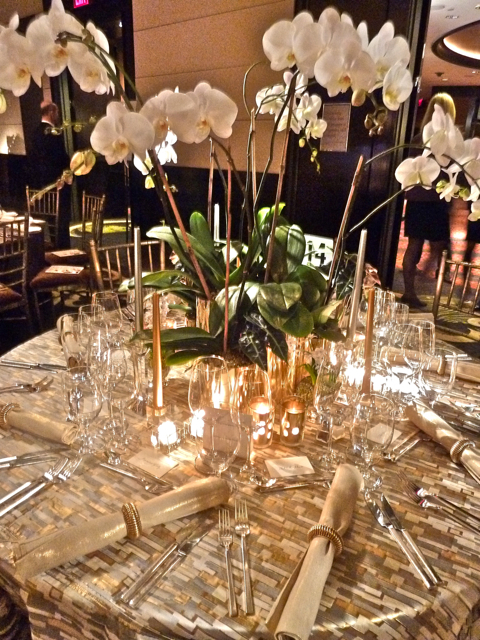 LMD Lewis Miller Design set an elegantly simply table where the pure white of the orchid was offset by the metallic tablecloth and napkin rings. 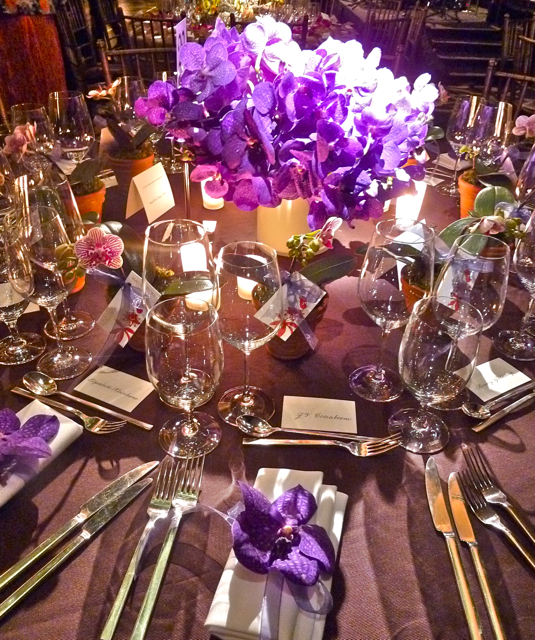 How beautiful is this riot of purple at MagnaFlora Design‘s table. Michael Walter for Lexington Gardens created a fun vertical ode to the garden with tools and bird houses at practically every level. Philip Gorrivan partnered with Lalique to create a table inspired by the classic Normandie. 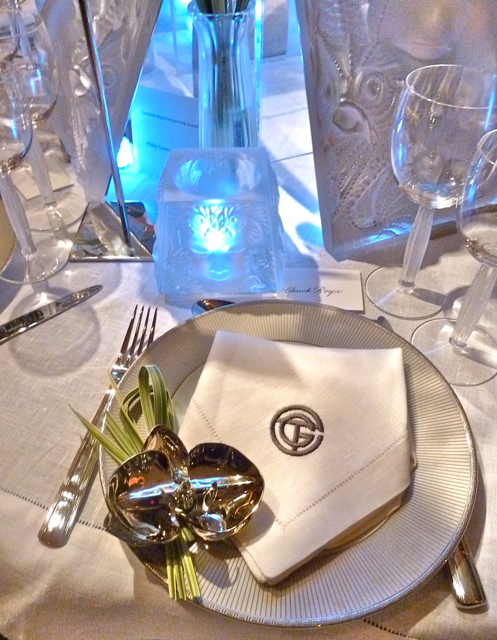 With flowers from l’Olivier Floral Atelier, Sferra Linens, Christofle flatware and china and deco style embroidery courtesty of Villa Savoia, the table was a spectacular contemporary nod to the amazing style of that iconic liner. 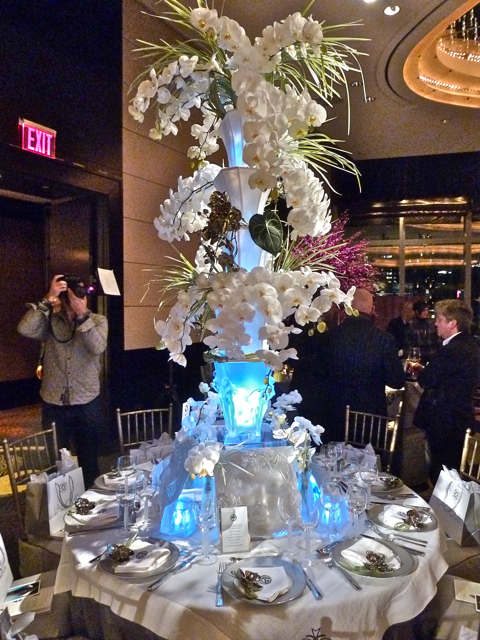 Robert Marinelli, RMID Enterprises purposefully created a low centerpiece to enable conversation. 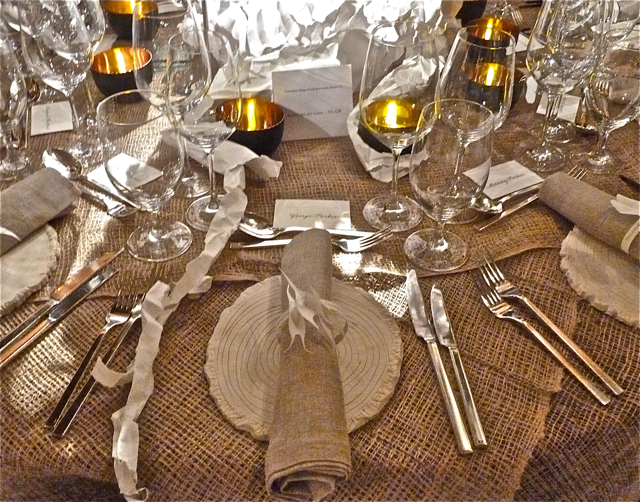 The incredibly youthful looking designer’s table had a lovely natural organic feel. It’s always fun when designers set the stage. 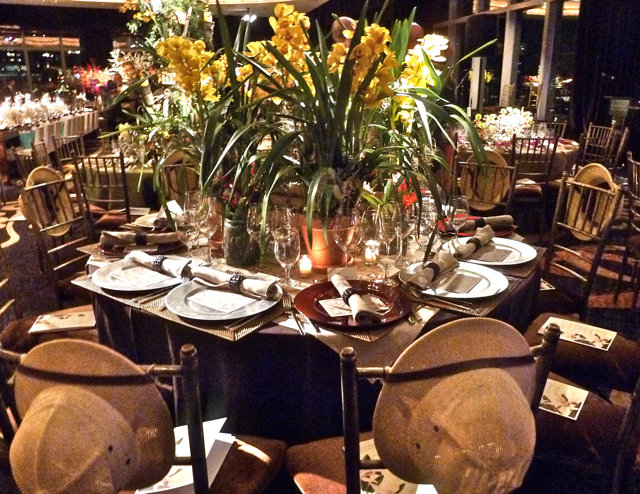 Roric Tobin for Geoffrey Bradfield created an entire safari theme, hats and all. 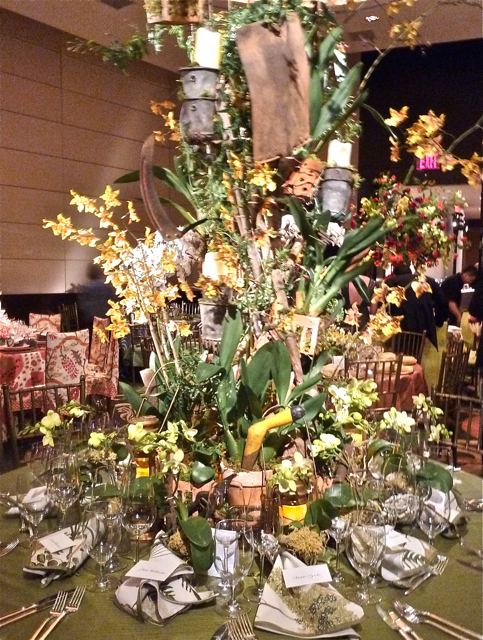 The rustic chic worked perfectly with the beautiful yellow. 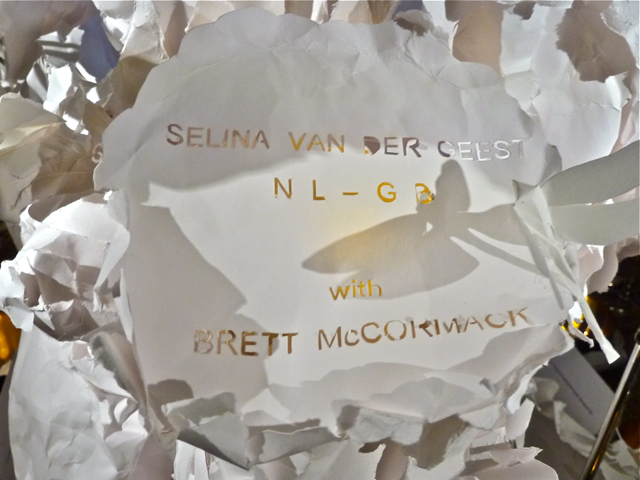 One of the most creative centerpieces of the evening was by Selina van der Geest – NL-GB with Brett McCormack. Constructed entirely of paper, this was truly a work of art. How fabulous is their signature, reminiscent of childhood tree carvings. 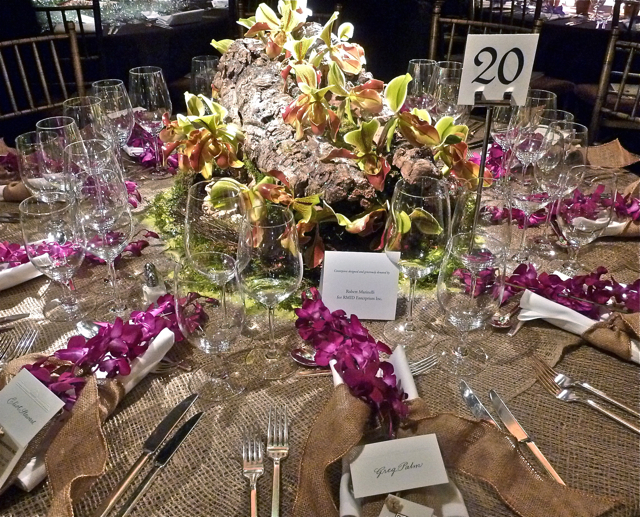 Sherrill Canet with Phillip Jeffries table had a sophisticated sort of Out of Africa appeal. 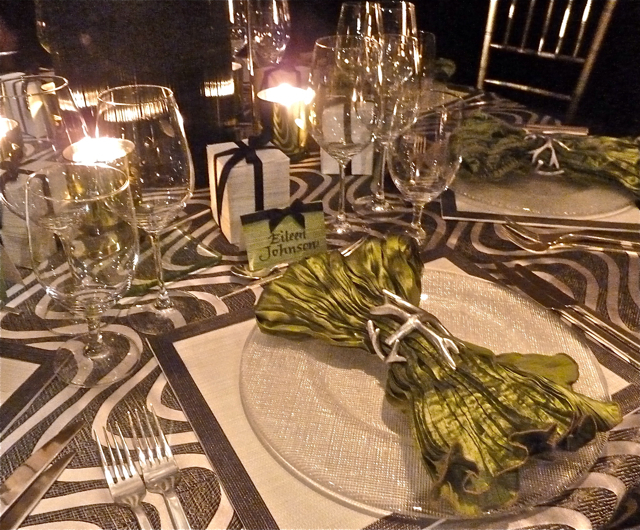 I loved the play of textures and the jolt of slightly acid green. 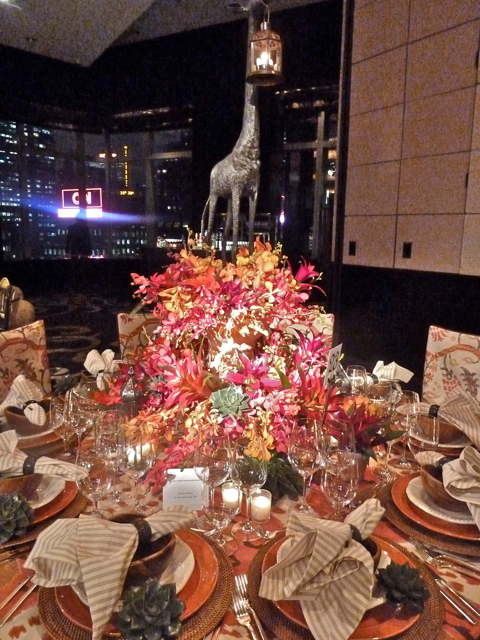 Lastly, Stephen Elrod for Brunschwig also gave a nod to Africa with his giraffe topped bouquet. The riot of color in the flowers was echoed in the colorful new Brunschwig pattern. 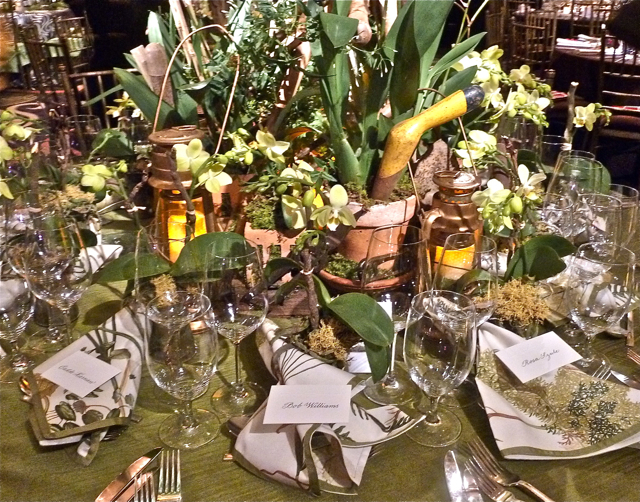 The crowd was happy as the proceeds from the evening, around $600,000, support the Garden’s orchid research and education. ALERT TRENDS !!! FASHION... MINT ! !